Ford’s popular Escape rolls into 2015 with a new Magnetic Metallic paint color choice and a new SE Chrome Appearance Package that dresses up the mid-grade model with fancier trimmings. 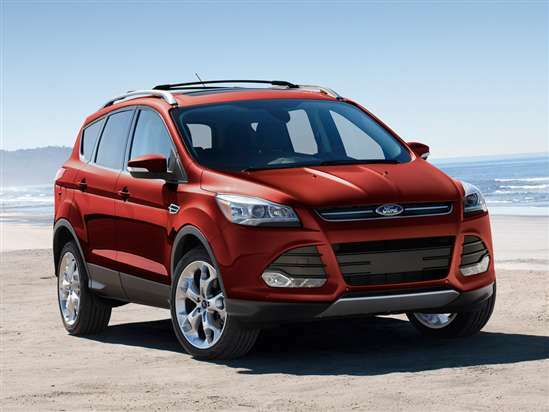 A compact, 5-passenger, crossover SUV, the 2015 Escape is offered in S, SE, and Titanium trim levels. Key highlights of the Escape SE include dark tinted rear privacy glass, a power driver’s seat, aluminum wheels, and trim upgrades. Titanium models are equipped with leather, automatic climate control, keyless entry with push-button starting, a MyFord Touch infotainment system, and lots more. Select the Escape S and your only engine choice is the standard 2.5-liter 4-cylinder engine, which sends 168 horsepower to the crossover’s front wheels through a 6-speed automatic transmission. An all-wheel-drive system is not offered for the Escape S.
The Escape SE and Titanium models offer an optional AWD system, as well as a choice between two turbocharged 4-cylinder engines, each paired with a 6-speed automatic. The standard engine is a 1.6-liter 4-cylinder EcoBoost engine cranking out 178 horsepower and more torque than the Escape S model’s motor. Escape SE and Titanium buyers can upgrade to a turbocharged 2.0-liter 4-cylinder EcoBoost engine that makes a healthy 240 horsepower and enough torque to make this SUV feel downright quick. Your choice between different Escape engines really comes down to whether you’d like to go fast or not, because according to EPA fuel economy estimates, every Ford Escape is rated to return between 24 mpg and 26 mpg in combined driving, regardless of engine or drivetrain selection. Last year’s Escape received a 4-star overall crash-test rating from the NHTSA combined with “Good” ratings from the Insurance Institute for Highway Safety (IIHS) with the single exception of the small overlap frontal-impact test, in which Ford’s popular compact SUV garnered a “Poor” rating. For 2015, the NHTSA has carried forward only the Escape’s side-impact crash-test results, a strong indication that perhaps engineers have undertaken some unpublicized structural modifications in order to rectify that “Poor” rating from the IIHS. For now, we’ll need to wait and see. There’s no shortage of safety features for the 2015 Escape. Standard equipment includes a MyKey system that allows the owner to set specific, safety-related features regarding seat belt usage, vehicle speed, stereo volume, and more. Standard Sync Bluetooth pairing includes a 911 Assist feature that springs into action whenever the airbags deploy, helping to speed rescuers to the scene of a collision. Available upgrades include rain-sensing wipers, a blind spot warning system, and a rear cross-traffic warning system. On the infotainment front, the Escape’s MyFord Touch infotainment system and navigation system supply plenty to keep the driver informed and entertained. The Escape is also offered with a hands-free power tailgate activated by waving a foot under the rear bumper, while an Active Park Assist system autonomously steers the SUV into a parallel parking space while the driver operates the pedals and transmission.